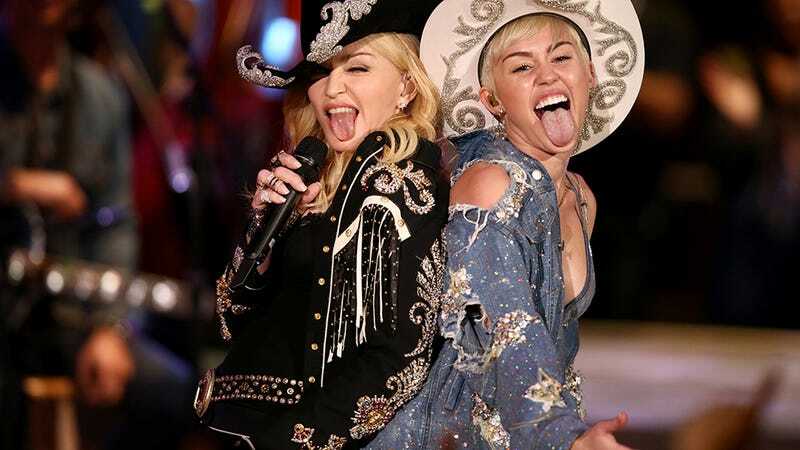 Miley Cyrus taped an episode of MTV's Unplugged last night, which will air tonight, and her special guest was none other than Madonna. The two wore matching cowboy hats and tongues lolling out of their mouths for the occasion. The pair performed a mash-up of "Don't Tell Me" and "We Can't Stop." All of you Miley-purists (?) will be overjoyed to learn that she did indeed twerk a bit; she also ground up on a giant horse, which is new.